This unit is a extra large one bedroom plus den (could be a 2nd bedroom) 763 sq.ft. Penthouse, with a large North facing terrace. The suite has polished concrete floors, 10’ ceilings, skylight, sliding glass partitions to bedroom & den areas, and a linear style European kitchen with integrated appliances. The bathroom features modern wood cabinetry and marble surfaces with walk-in shower. Offering Southern exposure at the entrance area patio, and Northern city & mountain views from the living area and main entertainment sized patio space. Two patios totalling 363 sq.ft. in outdoor space. Plenty of storage & closet space throughout. 2 parking stalls and 1 storage locker. Unique Penthouse loft at “Jacobsen”. This loft inspired development has become amongst the most sought after buildings in Mount Pleasant. Developed by Intracorp an award winning company specializing in high quality. Modern design and attention to detail is the theme throughout this whole development. Total Living Area: 676 Sq.Ft. Welcome to your top-floor well designed 1 bedroom condo at the "Wood Dale". Functional 475 sq.ft. floor plan with large sunny south facing patio. Suite includes many upgrades: laminate flooring, upgraded kitchen cabinets, countertops, stai nless steel appliances, and a revamped bathroom with new vanity, and cork wood flooring. Features: 1 parking stall, 1 storage locker, laundry room, & bike room. Building has been extremely well maintained with many completed upgrades: new roof, balcony membranes, parkade membrane, landscaping, plumbing, boilers, and recently painted exterior. No rentals allowed. Two pets allowed. Close to Main St's best shops and restaurants. View my new listing for sale at #712 221 Union Street, Vancouver and currently listed at $425,000. Welcome to your large 676 sq.ft. one bedroom loft style condo at "V6A". A 2010 development with a focus on open concept design and expansive living room. This suite includes high 8'6" ceilings, and a large patio space with Northern Exposure. Modernist design features: sleek kitchen with stainless steel Kitchen-Aid appliances, stone surfaces, and wood cabinetry, beautiful concrete polished floors throughout, sliding glass walls for the bedroom, plenty of closet & storage space, and a full sized bathroom. 1 parking, 1 storage & a well equipped gym with top-of-the-line equipment. Located in the heart of the city between Mount Pleasant, Chinatown and Gastown. Listed by RE/MAX Select Realty, sold by Paul Albrighton. Live, work. This tasteful, unique minimalist space is an urban oasis in a very walkable location just off Main Street. With soaring ceilings, exposed framework and concrete floors, the open plan is bright & spacious with a real art nouveau feeling to it. Open kitchen has island & ample cupboard space opposite a large, multi-function living/sleeping space. The sparkling white tiled bath is modern & elegant. 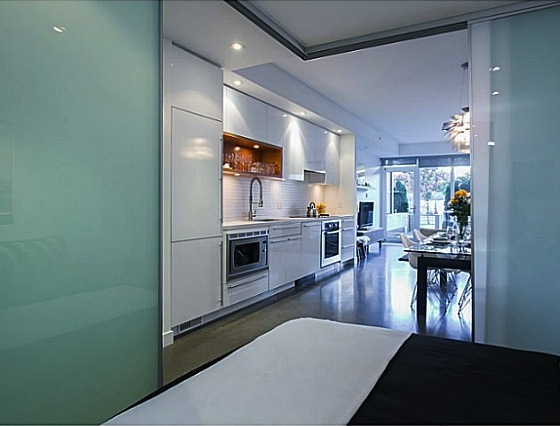 Floor to ceiling glass doors keep the space bathed in natural light & breeze from Juliet balcony. Building has rooftop garden picnic area & large meeting room. 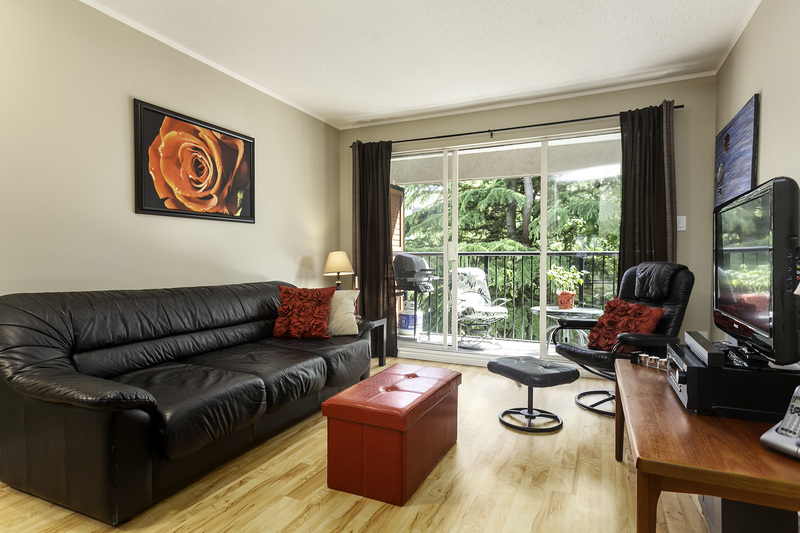 Close to Skytrain, Emily Car & shopping on Main Street. Bring your design ideas to this clean, blank canvas! 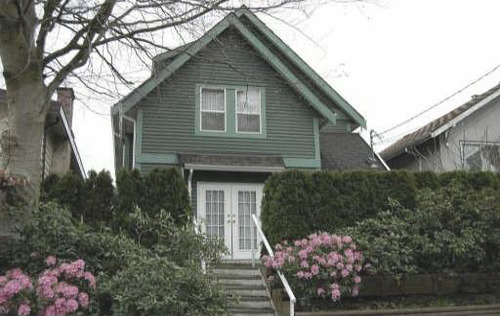 Listed by RE/MAX Crest Westside (VanW7), sold by Paul Albrighton. True Sub-Penthouse at the District! One of a Kind Unit; Never Before released for Sale. NE Corner Unit Wrapped in Glass with 270 degree views of Downtown, BC Place, North Shore Mountains, SFU & Metrotown to the SE. Perfectly Designed Plan with No Wasted Space and No Unit Directly Above. Developer Customizations Include 30 Bottle Wine Fridge, Wood Floors Throughout and 3 sliding Doors to your 525 Sq Foot Private Terrace! Just in Time for Sunny Weather! Jacobsen, Mount Pleasant's greatest & meticulously designed live/work building for young urban professionals. Open floor plans with linear, clean lines throughout. The interiors truly embraces west coast living, with polished concrete floors, white cabinets with teak touches, full-height translucent glass sliding panels throughout, and 9-foot 2-inch ceilings. Integrated high-quality appliances. Each home is equipped w/an integrated "local area network." Internet & home networking throughout, CAT 5e wiring for in-suite Ethernet network, telephone & ADSL internet & a distributed quad-shield RG6 coaxial cable run for cable TV, HDTV, & high speed internet access. Beautiful architectural design located in a central Mount Pleasant Location. Jacobsen at 256 E 2nd Ave is a Mount Pleasant loft style building. These architectural loft style suites offer open concept design, European styled kitchens, and stunning polished concrete floors. With a special attention to detail, design, and function, Jacobsen loft style condos offers something very unique and refined. Built in 2009. 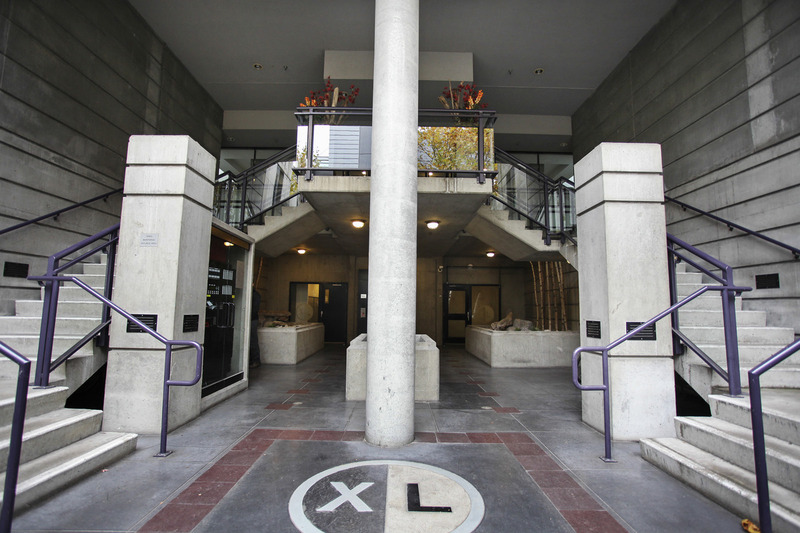 2 level penthouse loft residence at the solid concrete XL LOFTS building. Spacious 1038 sq.ft. floor plan with exposed concrete walls and detailing. Quality features include concrete counter tops, s/s appliances, gas fireplace, concrete floors on the main, bamboo floors upstairs, iron curled staircase, and floor-to-ceiling windows offering panoramic city views. 1 bedroom, 2 living rooms(room for a 2nd bedroom), private den, 2 bathrooms, and a 78 sq.ft. balcony. Open concept design, waiting for your modern furniture and interior detailing ideas. Architectural styled building located very centrally near Whole Foods, Transit/Canada Line, restaurants and shops. 1 parking spot included. Fantastic building with common gallery space. Listed by: RE/MAX Crest Realty Westside. Not a watered down version of a modern day loft, true 16 foot ceiling height loft with many updates to impress your friends. Features industrial halogen track lighting, stylish kitchen updated with SS appliances, gas stove and oversized sink. Exotic bamboo hardwood floor to warm up the industrial loft feel. 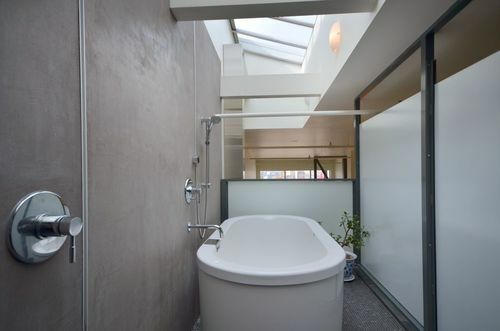 There is even an ensuite aside from the main bath on your bedroom level. Huge rooftop deck with mind blowing city and mountain views for your summer party needs. Walking distance to BCIT and Emily Carr and SFU Digital Media campuses. More Mount Pleasant Lofts for sale, click here. OPEN HOUSE, SATURDAY MAY 12TH, 12:00PM - 1:15PM. Above: Living area with custom wide-plank fir hardwood flooring. OPEN HOUSE Saturday Oct 23, 1:30pm - 3:00pm. Welcome to your "Country Style" loft at "The Workshop". 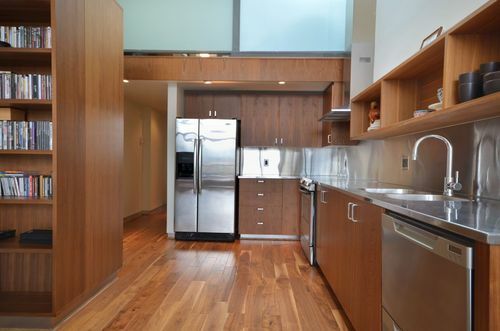 This architecturally beautiful customized two bedroom, two bathroom loft offers approx 1530 sq.ft. of bright warm living space. All in a rarely available corner unit with beautiful city and mountain views. The one-of-a-kind home has been finished with the finest materials. Some special features include: natural fir wood beams and posts, rod-iron railing, a "see-through glass" loft office, a large chefs kitchen with a professional range and hood, wide-plank custom hardwood flooring, gas fireplace, heated slate flooring in the main bathroom, solar reduction windows, and double insulated walls. Many customized storage spaces and built-ins offering plenty of flexibility. 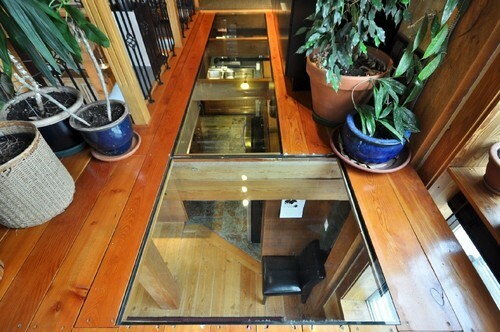 Above: Cutting Edge Glass floor in the upper loft area can withstand over 1000 lbs, allowing light to shine into the lower level. Above: Western views to the Mountains and Downtown Vancouver. Click here for more details on this Vancouver loft. This high quality concrete, modern, well designed residence was built in 2007. Offering a large 832 sq.ft. (approx) one large bedroom, den, and lounge. The build finish and details are very nice including; wood floors & cabinetry, granite counters, pot lighting, all in a very functional plan. Includes a grand master bedroom with walk-in closet, and a large bright den that could be used as a second bedroom. Enjoy the quiet South facing patio. Commute easily with immediate access to transit. This condo also includes 1 underground parking stall and 1 storage locker. #314 1220 E Pender St sold within 50 days for over asking. True live/work industrial style loft at The Workshop. Soaring 18' cielings, skylight, concrete floors, 1156 sq.ft., upgarded kitchen and bathrooms, minimalist modern masterpiece. This unique place was listed and sold within 50 days for over asking. 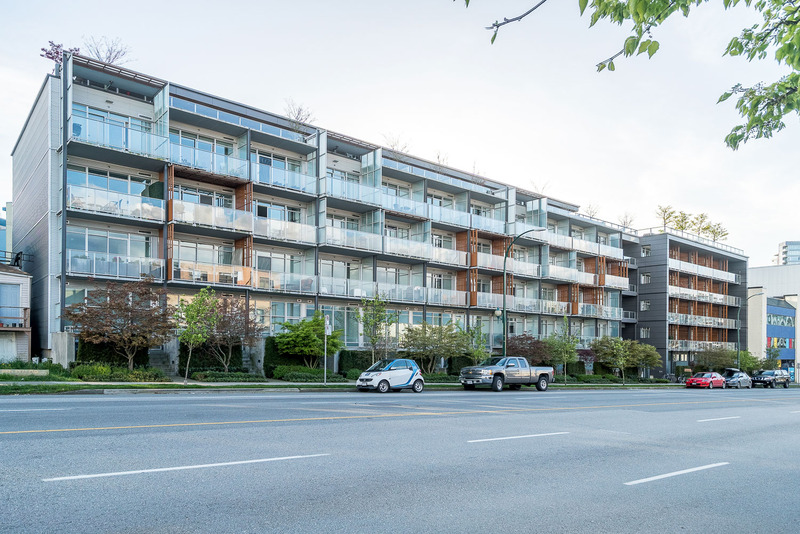 (Property Details) Click here for information on Albrighton Loft marketing, and contact Paul Albrighton at 604 315 5574 to get your Vancouver loft sold. 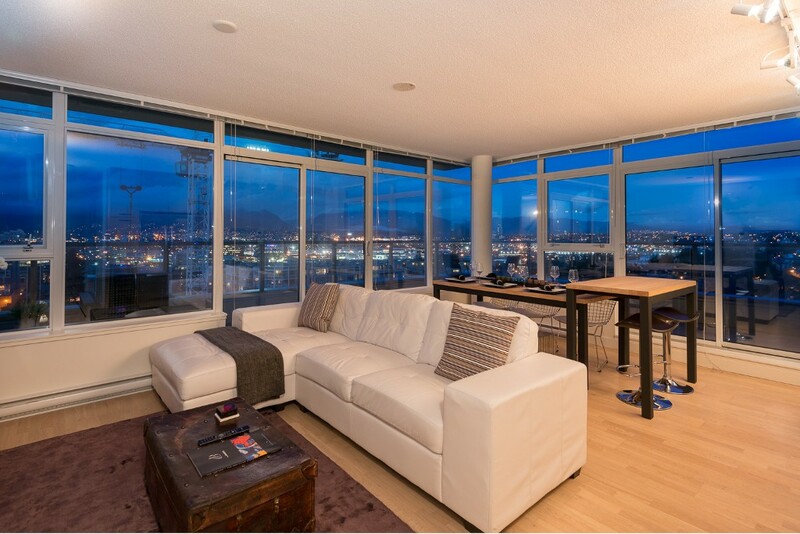 New live/work loft for sale at # 314 1220 E PENDER ST, Vancouver and currently listed at $449,000. This listing was marketed by Albrighton lofts. With our proven strategies and marketing tactics this listing was sold within 5 days for full asking price. 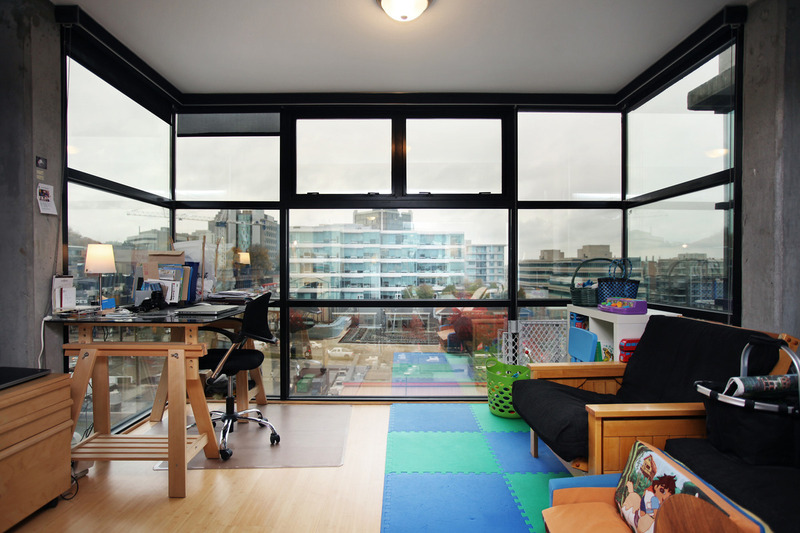 For more details on how to sell your Vancouver loft contact Paul Albrighton at 604 315 5574. Details on the Albrighton marketing plan. 'The Left Bank' concrete building at Main and Prior, featuring granite countertops, stainless steel appliances, secured parking, 9 foot ceilings, maple cabinets, hot water heating, and exposed concrete ceilings. 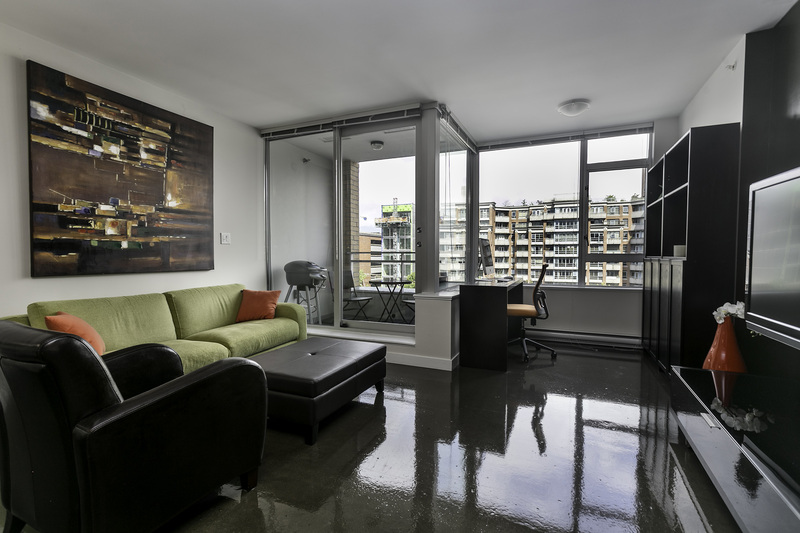 Bright and spacious LOFT 816 square foot unit with 1 bedroom and den features polished concrete floors. Walking distance to skytrain, Science World, False Creek seawall, south main, Gastown and Chinatown. # 206 919 STATION ST, Vancouver. Listed By: Dexter Associates Realty. Click here to see all lofts in Mount Pleasant for sale. We've added a new building webpage for Mainspace at 350 East 2nd Avenue in Vancouver, This is a live/work loft building with minimal industrial styling. Bring your ideas and your business to this unique Mount Pleasant Loft building. Please click here to view the the webpage for more information and a 360 degree view of the exterior via Google Maps. Beautiful south-facing loft in The Workshop building is brightly lit with large windows. This live and work top floor 1 bedroom, 1 bath unit has soaring 18' ceilings. Super cool lay-out on the mian with large living and dining area w/ white oak floors, master bedroom and 3 piece bath w/ japanese tub and bamboo feature wall. Upper level has kitchen w/ concrete countertops, opening skylighht and cozy eating area and large multi-purpose family room w/ built-in shelves along entire wall. Centrally located building is modern and features polished concrete hallways. # 312 1220 E PENDER ST, Vancouver. Listed By: RE/MAX Central. 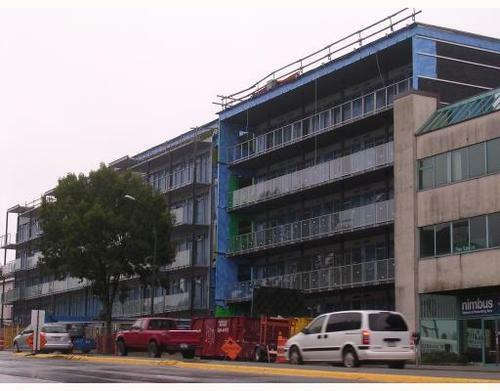 Click here to see all lofts for sale in Mount Pleasant Vancouver. 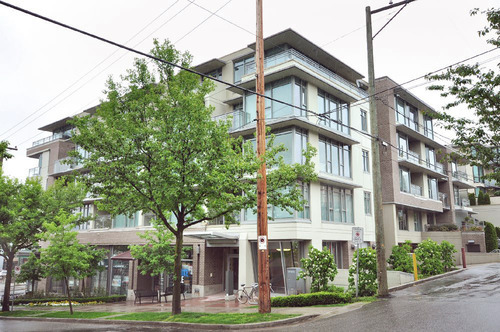 Click here to see all units for sale at The Worksgop, 1220 E. Pender St, Vancouver. #104 - 205 E 10th Ave - Contemporary loft for a great value! Live in style at The HUB in Mount Pleasant Vancouver. This open 1 bedroom patio suite feels like a townhouse with its 2 separate entrances. 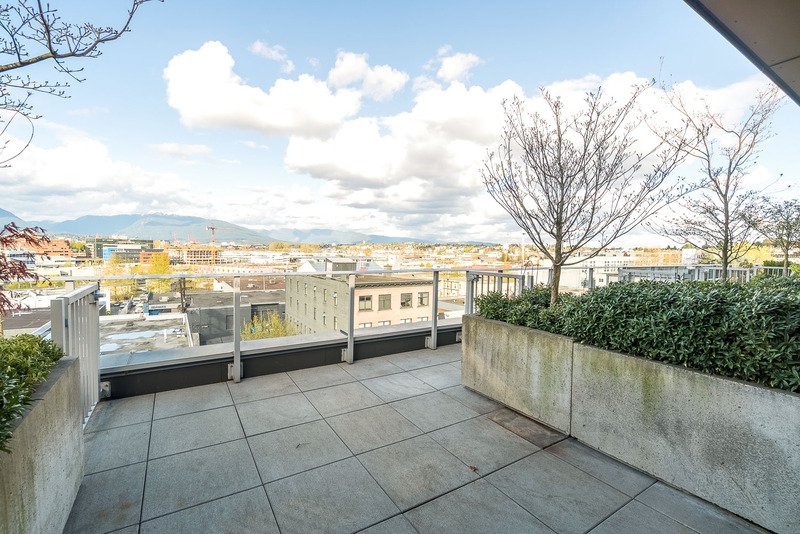 Features 11' ceilings, wide plank bamboo floors, stainless steel appliances, granite countertops, plenty of storage both in-suite and an extra locker, secure underground parking, 135 sq ft private patio and a common roof top deck with views of the city and mountains. Remainder of the 2-5-10 warranty still in place. 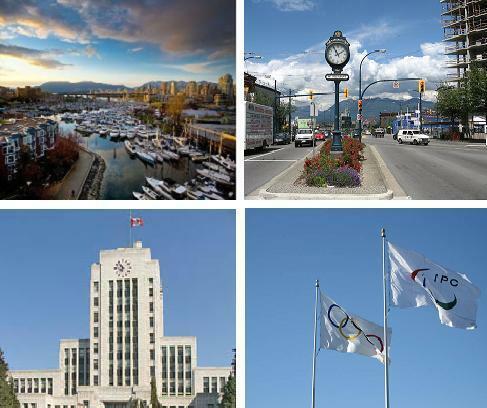 Conveniently located close to Downtown Vancouver, restaurants, shops, and pubs. # 104 205 E 10TH AV, Vancouver. Listed By: Dexter Associates Realty. Click here to see all lofts for sale in Mount Pleasant Vancouver. Live at Jacobsen, Vancouver's newest urban community - within walking distance to your favorite restaurants, stores, and entertainment venues. The sold-out Jacobsen urban flats developed by award-winning Intracorp and designed by Christopher Bozyk Architects. Close to Downtown Vancouver and just steps away from Olympic Village. Estimated to complete in November 2009. This sleek urban loft unit is designed with extra closet space, a flex space, a full size den, 9'2 ceilings. Unit also comes with upgraded appliances and parking. # 506 256 E 2ND AV, Vancouver. Listed By: Macdonald Realty Westmar. 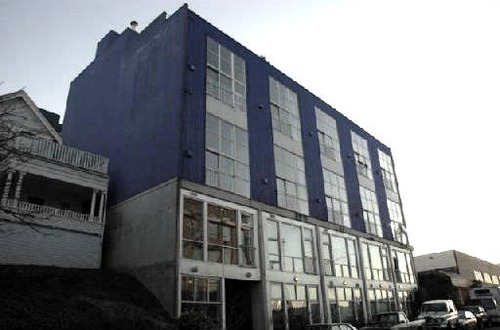 Click here to see all lofts for sale in Mount Pleasant, Vancouver. This is a good Mount Pleasant Live/Work industrial style loft building. This 55 unit building features two level lofts with great layout, an open courtyard, and always good prices. See the information page with photos, summary, description, and current lofts for sale. See all Mount Pleasant Lofts for sale. Jacobsen at 256 E 2nd Ave. This Intracorp upcoming development featuers loft style condos with great layouts in Mount Pleasant. The due date is for October 2009. Each unit has open concept design, European style finishing's and appliances, polished concrete floors, high ceilings, and some outdoor space - some with great city views. We've just added an information page with daily updated listings for this great loft style building. See the Jacobsen Homepage. Here is an outside shot in the construction process. There is currently a variety of assignment for sale, see the list of lofts for sale, and contact Paul Albrighton for any inquiries. Contemporary loft fully renovated inspired by the designs featured in Dwell magazine. This modern loft has just undergone an amazing renovation. Features architectural mono-stringer staircase with air craft cable and stainless handrail, 1" structural glass floor and wide plank ash hardwood in the loft and polished concrete floors on the main. The kitchen is very gourmet, complete with high gloss red cabinets, back painted glass backsplash, custom concrete counters and sink, European appliances. This loft is a modernists dream with soaring 16 ft ceilings and gallery white walls just waiting for perfect pieces of art. # 316 336 E 1ST AV, Vancouver. Listed By: Amex Broadway West Realty. Click here to see all lofts for sale in Mount Pleasant Vancouver. Enjoy unobstructed mountain and city views from this rare Mount Pleasant live/work contemporary loft. Newly renovated, offering a desired open floor plan featuring soaring 10 ft ceilings with 8 inch concrete walls. Relax or entertain on your large 14x9 private outdoor deck overlooking the city. Insuite laundry, cozy natural gas fireplace, pets/rentals allowed, Main and Cambie location, walk to skytrain, seawall and shopping. # 303 128 W 6TH AV, Vancouver. Listed By: Prudential Sussex Realty. Click here to see all Mount Pleasant lofts for sale. Mount Pleasant stretches from Cambie Street to Clark Drive, and contains Vancouver City Hall, and the newly-built Canada Line skytrain. 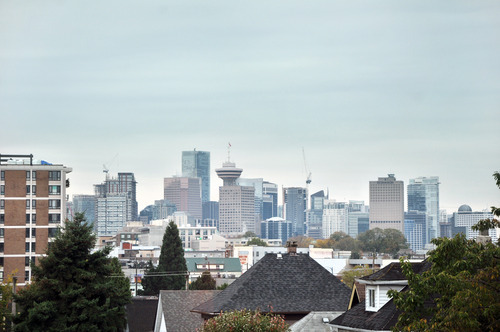 This is one of the most up and coming neighbourhoods of Vancouver, and is home to many first-time homeowners, young professionals, and an increasing number of families. This area has a blend of new and old homes, light industry, and educational facilities. Other places in the area include the Mount Pleasant Community Centre, Library, and a number of parks. The main shopping areas include West Broadway and areas along Cambie and Main Streets. There has been an increase in the number of upscale restaurants and boutiques. Mount Pleasant is home to many metal cladding warehouse loft live/work style residences. Many artists and studio owners have placed both their homes and businesses in lofts in this growing neighbourhood. Mount Pleasant has a plenty of new developments from starter condos, to modern styled loft condo buildings. 1220 E Pender - Mount Pleasant raw loft 1000+ sq.ft. Do you need your Vancouver loft painted? I refer my clients to Lee Albrighton who is a professional residential and commercial painter. He specializes in architectural property, residential interiors, and also loft spaces. When prepping a large loft for painting Lee Albirighton says "9/10 of the work is in the preparation." 1220 E Pender St Live/Work loft undergoing a full paint job. Today I visited one of my clients new loft at The Workshop located at 1220 E Pender in Mount Pleasant. (Click this link to see tihs sold property). 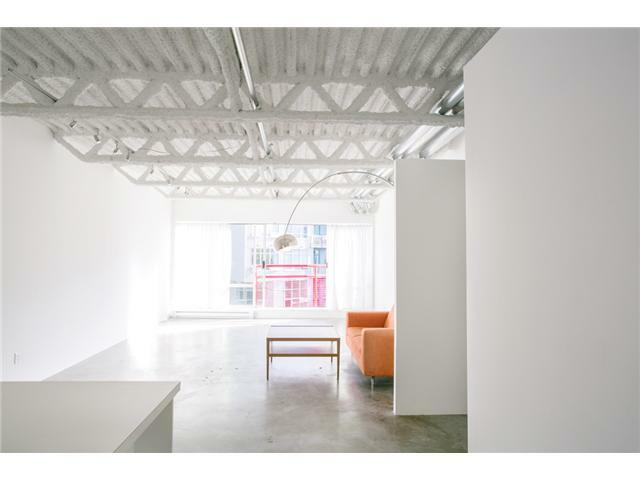 This 1100sq.ft.+ industrial style live/work loft has over 18' ceilings, concrete floors, and an awesome open plan. The property is getting ready for some updates including a full spray of white paint. Check out the quick video. 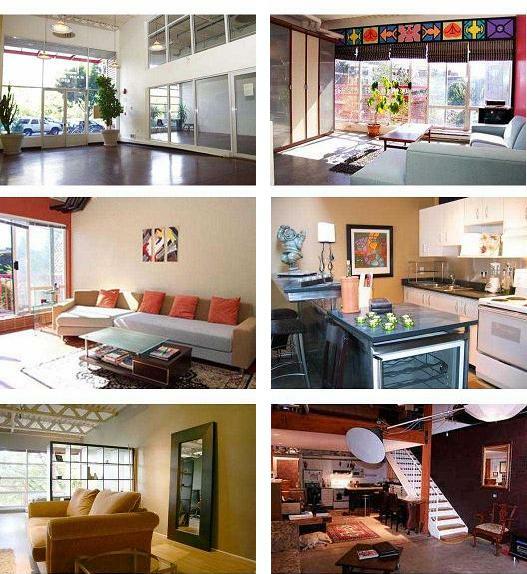 Beautiful Dwell Style Mount Plesant Loft - rarely available live/work 1 bedroom + office loft townhome. Custom staircase/railing, concrete counters, zebrawood floors, 6x6 skylight, 18' ceiling, double shower ensuite, stainless steel backsplash + appliances. Mount Pleasant Lofts for sale. Listed by Macdonald Realty Ltd.
We've just uploaded a building page with information and photos about one of my favourite Live/work warehouse loft building, The Workshop. This building is located between Mount Pleasant and Strathcona. Click here to see the building webpage. THE WORKSHOP". Ideal New York style loft. Huge open kitchen, dining & living rms perfect for entertaining or work space. Bright open kitchen w/ S/S counter tops. Concrete floors. Separate loft area. 16' ceilings. 12' windows w/ city & mountain views. Fabulous work/live space. Rare 'live/work loft' space at 'The Workshop.' Top flr S-fac w/nice city views & skylight. Solid bldg w/16 ft ceil, concrete flr s, walls, clad in steel, raw sp ace awaiting your ideas. Varied uses permitted in building. This a great Live/Work loft building with a true industrial feel. This unique 1193 square feet 1 bedroom and 1 bathroom loft features 16+ ceilings. 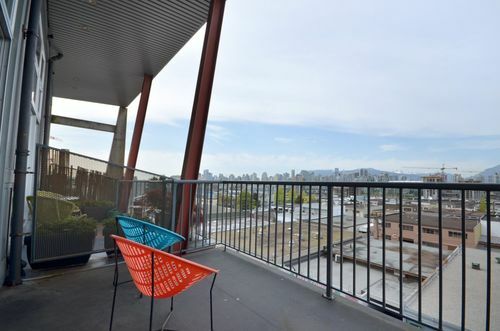 This amazing live and work loft is situated in highly desirable extended-Strathcona area. The main entrance opens onto polished cement floors, which lead past your spacious bathroom with a soaker tub. Your kitchen is completely modernized and fully fitted, opening to your spacious living room and eating area/dining room, a walk in pantry, up a flight of stairs to your second level bedroom. 18 1/2 foot ceilings, make this space bright and airy. Pets and rentals allowed. Click here for Property Details. Mount Pleasant Vancouver Lofts, loft style condos, warehouse lofts starting from $340,000. Mount Pleasant features unique hertiage buildings, two level lofts, live/work lofts, and loft warehouse converison buildings not found elsewhere. See all Mount Pleasant Loft listings: http://www.albrighton.ca/mount_pleasant_lofts.html this website is updated daily with Vancouver lofts listings. All listings are under compliance with the mlsr system. 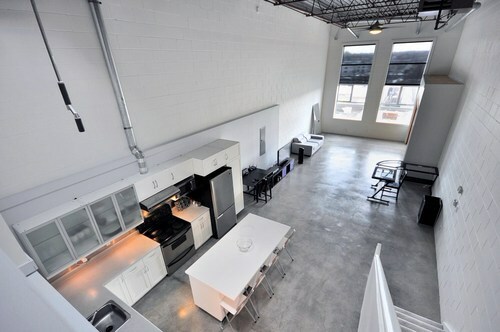 We just sold this great open concept warehouse live/work loft. This suite featured over 1179 sq.ft. and was listed at $420,000. This is a great Warehouse true live/work two level loft. Current property for sale at THE WORKSHOP 1220 E Pender. This building allows for proper live/work spaces. It is built like a warehouse out of concrete block and steel, making for a great qaulity low maintenance building. Comments about the sutie. Bright South facing 1179 sq ft live/work loft on the top of The Workshop with 18'5 ceilings, huge windows, opening skylight and polished concrete floors. Gourmet kitchen features stainless steel appliances and tons of cabinet space. Bathroom has a heated tile floor and soaker tub. Staircase leads to bedroom mezzanine with large washer & dryer. Plenty of storage. Safe, well-managed building with secure underground parking. Located in beautiful Strathcona with parks nearby, 10 minute walk to Commercial Drive, close to Downtown/transit. Pets/rentals allowed/restrictions. This is a great Mount Pleasant Live/Work loft. # 314 1220 E PENDER ST, Vancouver Lofts by Albrighton. Soma lofts at 2635 Prince Edward St features loft style condos which offer plenty of space, open concept living, and modern designs. 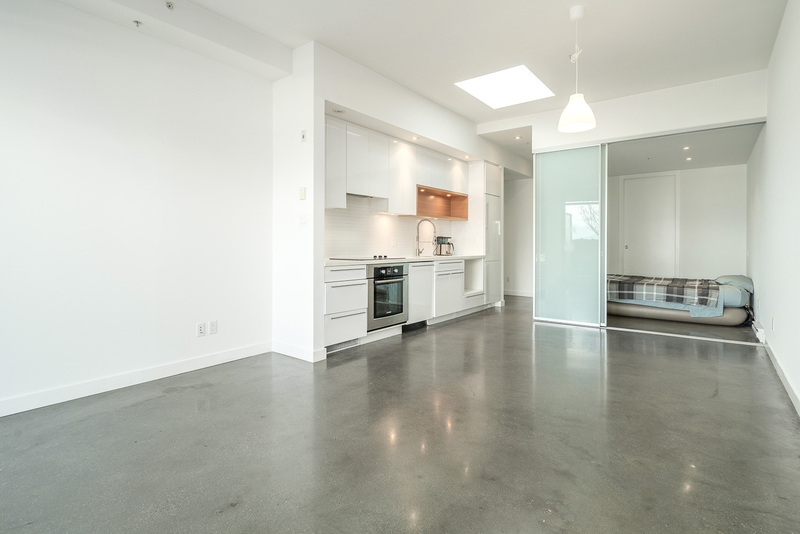 From 10' high ceilings, polished concrete floors, to fully utlized floor plans. This is a highly desired 2006 built concrete loft building. Current property for sale: # 203 2635 PRINCE EDWARD ST, 863 sq.ft. $465,000. Building Webpage for 228 E 4th Ave. Welcome to Mount Pleasant's best loft warehouse building. 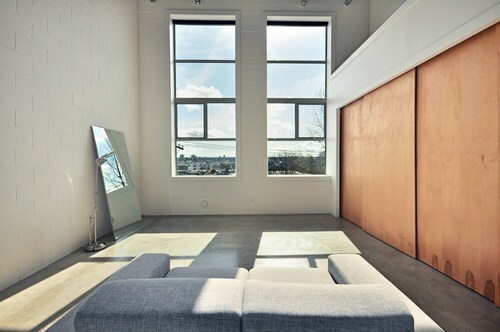 Here's a great opportunity to get into one of Vancouver's best loft buildings at a great price. Live with over 700 sqft and featuring soaring ceilings this space can be used as not only an amazing home but a great office space as well. Located just off Main St and in the heart of Mount Pleasant you could be surrounded by great restaurants, boutiques, coffee shops, and you're still only a short stroll to Downtown Vancouver. Come see what makes "The Watershed" such an amazing place to call home. Over 700 sq.ft. for only $339,000. We've just updated a new building webpage for 234 E 5th Ave - Granite Block. These are great artist live/work lofts located in Mount Pleasant. They feature two level suites in a well built concrete building. Click here to see the building webpage. Great space in this 2 level legal loft at the granite block. 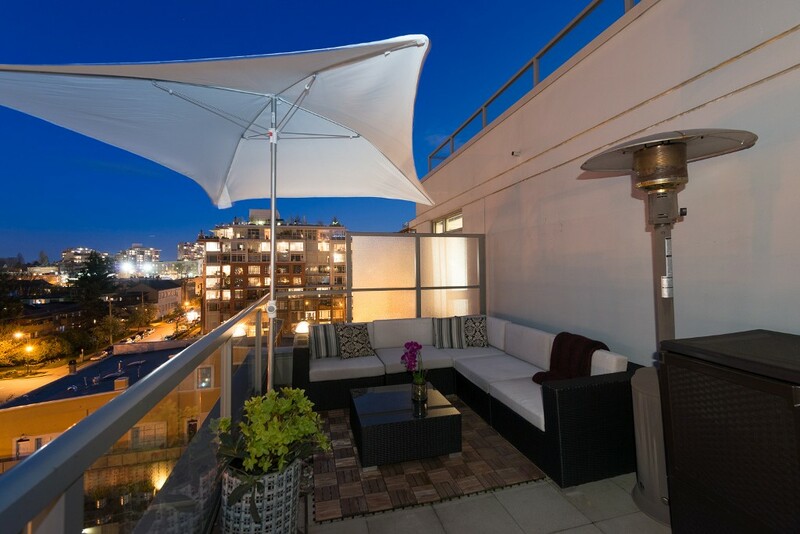 Great private city view, 16' ce ilings, gasline, common roof deck w/panoramic views. 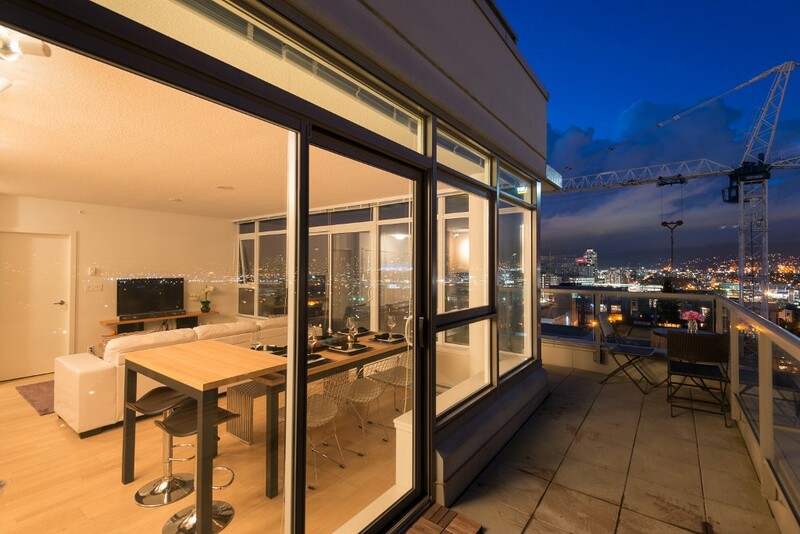 Solid exclusive building of only 18 loft units is one of a kind Vancouver loft spot. Pets okay. Limited rentals. 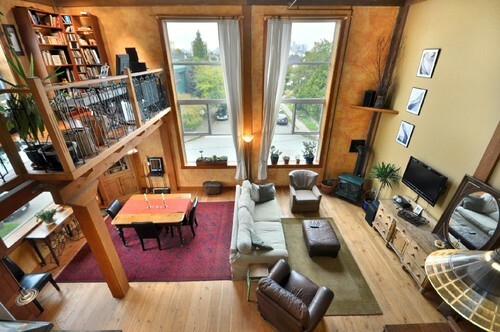 Super loft! Super price! 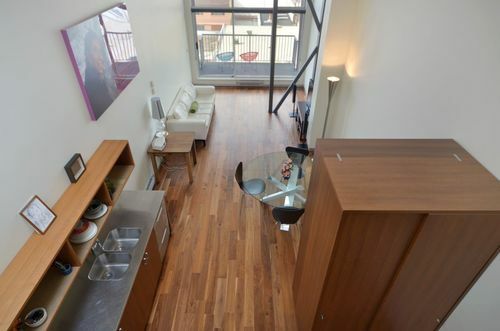 Legal loft w/city view, spacious layout, tiled entrance & kitchen floor. Glass block details, wood ceil, solid conc bldg. Pet friendly. Dynamic assumable mtge! For 3 yrs great common roof deck w/incredible views. Bright & cheery 2 level loft with south west view. Spacious kitchen with bar cou nter. 234 E 5th Ave a Mount Pleasant Vancouver loft building with 16' ceiling in living room. Spacious two level loft space. Gas fireplace, insuite laundry. A pleasure to show. Presently rented at $1,000. Excellent common roof deck with view. Lovely home on 2 fully fenced lots with many updates & detached garage with opener. Newer tile & laminate flooring throughout main and new carpet up, large bright foyer, spacious update kitchen with pantry, gas fireplace in living room, main floor bedroom & laundry, brand new spacious 4 piece bathroom with deep jetted dual tub and stand up shower. newly insulated with new siding, metal roof, 100 amp service & includes 6 appliances. New furnace with the updates. Loft living at The Granite Block in Mount Pleasant Vancouver presented by Albrighton lofts. There is currently four listings at Artech Lofts located at 336 E 1st Ave. This is a very cool warehouse live/work loft building. From extra high concrete floored hallways to delivery size elevators this loft building offers a unique industrial feel. See our building webpage with a few Photos and some information on the building. Artech Lofts Building Page. 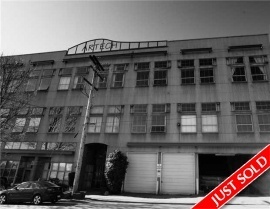 See all the lofts for sale at Artech. it is rare that there is such inventory for sale in this building. Take Advantage, and call for a showing today. Paul Albrighton 604 315 5574. Artech Loft building suite comments: Top floor corner, high ceilings, polished concrete f loors, hardwood, large kitchen, rooftop deck. Absolutely stunning! Lofted as art ist live work art studio. Property contains accommodation not auth. 336 E 1st Ave Artech Loft building in Mount Pleasant. Endless Space, bright South facing artist live/work studio 18' ceilings, 288 sq ft steel reinforced lot with sleeping and office area. Unique features include a rchitecturally designed floor to ceiling bookshelf, 16' extreme climbing wall ad a mossaic hand painted wall. Upgraded bathroom, terra-cotta tiles and parquet floors throughout. Building is pet friendly and offers a huge rooftop deck with a wonderful garden. Gorgeous artist loft w/exceptional details by builder Earl Cunningham. Huge lega l loft. Generous closet space/ldry. Superb quality, 4 pce bath w/quality tile wo rk. Stainless/maple details throughout. Funky gourmet centre island w/E/A. que loft. This cdmn/loft is sit on the top flr of this bldg. It shares an eno rmous full view deck with 9 other lofts. 336 E 1st Ave Loft building. It is fabulous, can have your own grdn. The ceiling goes up to 21', gas F/P, H/W flrs, F-C S facing wndws. Penthouse Loft space in Mount Pleasant Vancouver. Artech loft warehouse building. Top floor of 'Artech' with beau tiful, full, unobstructed view of the city and mountains ... north and south exp osure, big kitchen with extra counter space built-in, gas stove, plus a separadining area, both facing the North view. 16' ceilings, expansive living area with a full wall of bright South facing windows, concrete floors, insuite laundry, lots of closet space, one secured parking space (#17), and outdoor patio area. Loft added with permit ... some finishing touches still need to be finished by an imaginative buyer. No Sunday or morning showings please. Live/work studio. GST paid in full. Vancouver Warehouse Live/Work loft building. Bright, cheery south facing loft!! Enter your new home from the 3rd floor. Beaut ifully renovated with tile flooring on main & hardwood (laminate) throughout (28 4sq ft) loft space. 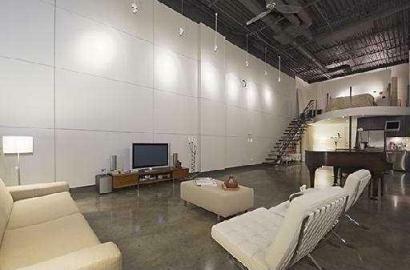 This loft is large enough to accommodate a king size suitein addition there is a built-in wall unit for extra storage. This space also incl an office extension on the 2nd flevel, perfect for a work at home professional. Kitchen features entertainment size eating bar plus all counter tops are finished in a c ool concrete. Main living area offers 18ft ceiling show casing floor to ceiling windows. Wide open & ready for your funky ideas...This unit also incl insuite laundry & gas hook up for future fireplace. Building amens: roof top deck w/panoramic view. Artech Lofts is a great live work loft building in Mount Pleasant Vancouver. 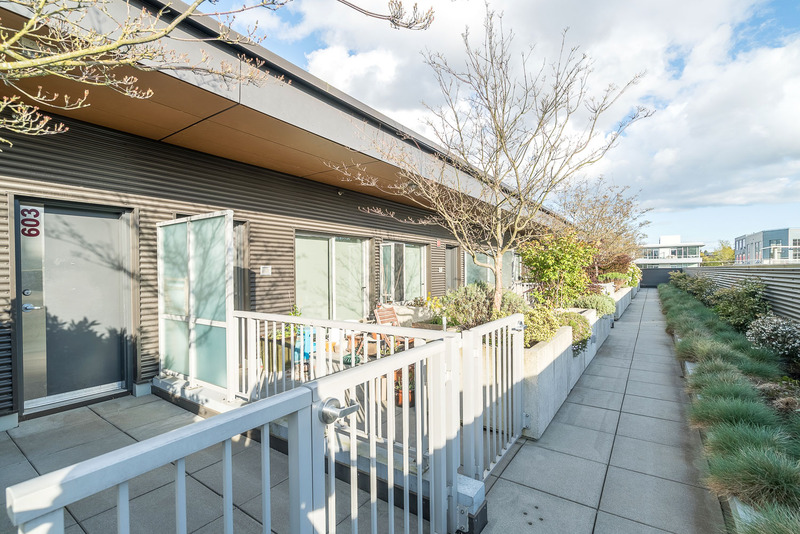 Westside lofty style condo for sale - at 2055 Yukon St.
Industrial Mount Pleasant Loft - #206 - 234 E 5th ave.
Don't miss the opportunity to experience this amazing Mount Pleasant Loft. Don't miss the opportunity to witness this one-of-a-kind Mount Pleasant Vancouver Loft. This is a list of some recent Mount Pleasant and Gastown lofts and loft style condos that offer great value and unique layouts. Be sure to check out all the Gastown lofts for sale, and all the Mount Pleasant Lofts for sale. 253 ALEXANDER ST - “The Edge” This is a ground floor loft style studio on Alexander street in a somewhat industrial area. This unit stands out for having very high ceilings, and it includes a parking stall. Two level lofts in the building are worth $365,000. # 318 237 E 4TH AV – “Artworks” This is one of the better Warehouse style loft building in Mount Pleasant. Here you get an open layout on one level and over 740 sq.ft.! This is a nicely priced listing, it also includes parking in the building. 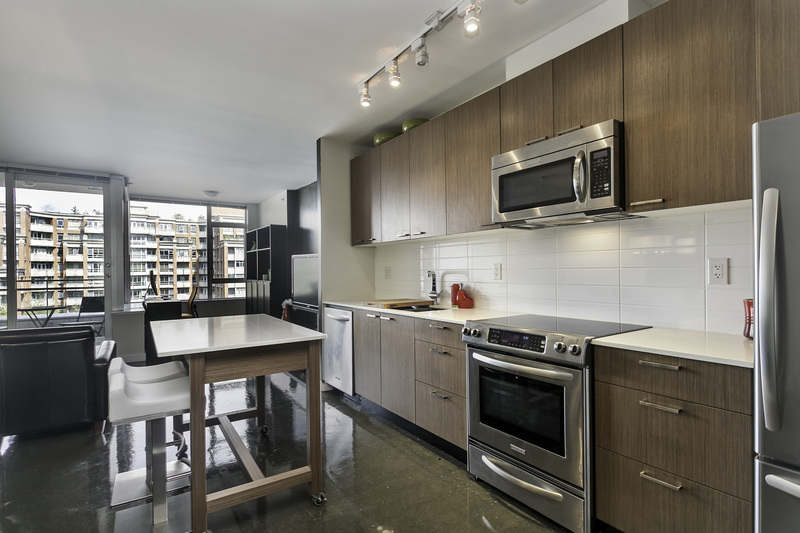 # 411 2635 PRINCE EDWARD ST – “Soma Lofts” is a newer loft style condo with nice finish and styling. Its near 11th Ave and Prince Edwards in Mount Pleasant. 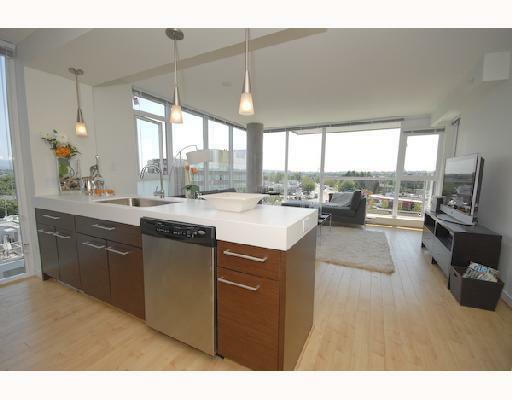 This unit features 10’5” ceilings, polished concrete floors, and some views. # 206 234 E 5TH AV – This is a beautiful real two level loft in Mount Pleasant, be sure to see the photos! The only downside is no parking, the area often has street parking, but security may be an issue. 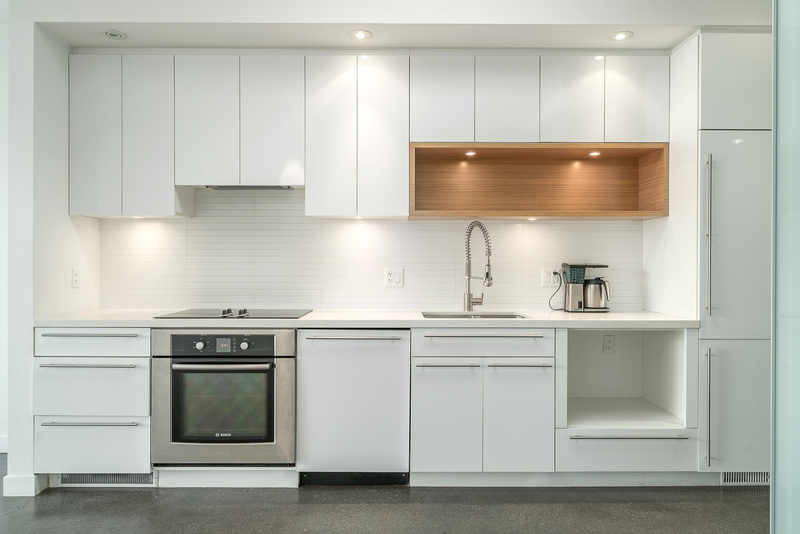 This extra modern Vancouver Cambie loft has been fully renovated to match your minimalist lifestyle! 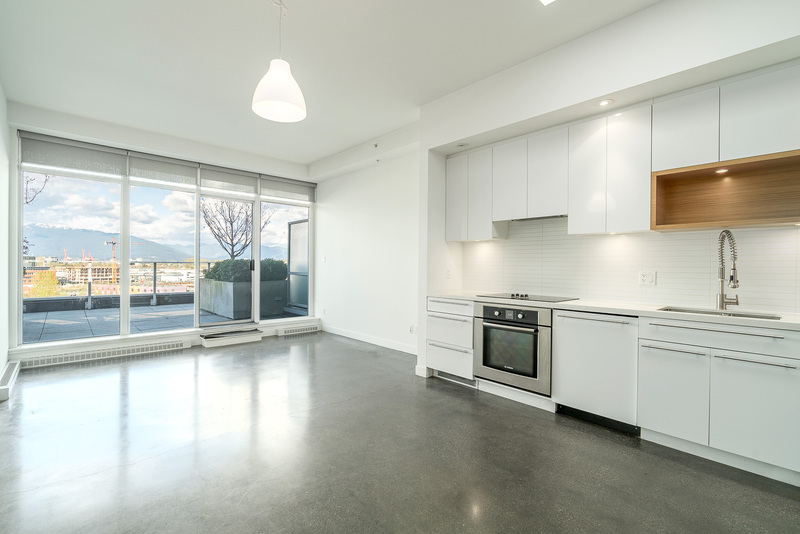 Enjoy polished white shiny concrete floors over 848 sqft (total square footage) two-level loft with amazing 16-foot ceilings and a huge 800+ sqft patio, perfect for BBQs, parties, and views Conveniently located close to the new Cambie Canada Line, Save-on Foods and Whole Foods. A minimalist's dream. Dwell-magazine inspired urban design includes sleek white epoxy concrete floors on main level, brand new kitchen with GE stainless steel appliances, custom concrete countertops, over-the-range microwave, drawers with self-closing devices and lots of cupboard storage. The entrance hall of this loft is beautifully decorated with custom art gallery book display and UK-imported wallpaper. Custom-designed workstation with hardwood/concrete deck and well-mounted high-gloss gray cabinet from BoConcept. Huge upstairs bedroom outfitted with eco-friendly chocolate brown hardwood floors. Listed by. Dexter Associates Realty. Contact Paul Albrighton at 604 315 5574 for more information. 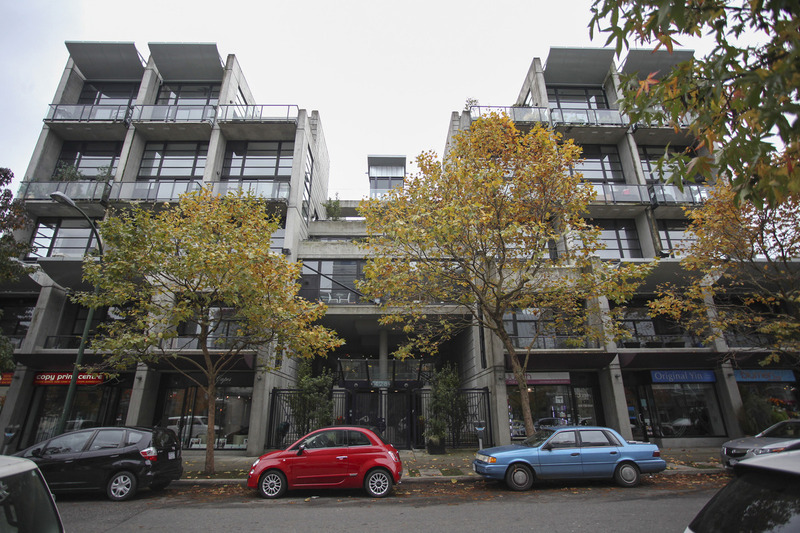 Vancouver loft style condo picks near Mount Pleasant $300k - $360k. # C8 238 E 10TH AV – “Studio 10” This is a unique loft. It is quite industrial and seems to have a “unique layout”. It could leave some room for your ideas/a renovation. # 303 2055 YUKON ST – “The Monteux”this architectural style buliding. This unit also has good den space and nearly 700 sq.ft. -This isn't in Mount Pleasant E, its near the new Olympic Village. # 104 2036 YORK AV – “The Charleston” This I added as a slight alternative (You never know) This is a Kitsilano character building made from brick and concrete. This suite features some character, decent space and a fabulous location. Contact Paul Albrighton for more information on these suties. 604 315 5574. Fabulous loft space - zoned for live/work - boasting 1000 square feet of living space and 15' ceilings just off Main Street! very well run building that is impeccably maintained with common area upgrades paid for and on the way.Incredible City and North Mountains Views! Interior highlights include a spectacular custom-built steel and fir spiral staircase, uniquely laid Baltic birch floors, cozy gas fireplace, gas stove, tons of built-in storage options and in-suite laundry. The huge common rooftop patio is perfect for entertaining or BBQing. Secured parking and bike storage, This is a special home! First Open House is Saturday, January 24 from 2-4pm. Come check it out! Prices starting at $382,900 - (Developer's are taking/looking at offers these days) Current best price condo on the market. This unique 1500 sq.ft loft at THE WORKSHOP 1220 E Pender is a Gorgeous SE corner Artist Live/Work Penthouse loft offers endless open space with high soaring ceilings & recently featured on REALTY TV. Gourmet kitchen features granite counters with under mounted corner sinks. Functional island w/ beautiful wood counter, S/S appliances & two wine fridges. Spa-like bathroom features slate shower w/ high-end fixtures. Architect-designed steel staircase leads to large bedroom loft with plenty of hidden storage and insuite laundry. Designer lighting & skylight. RARE BONUS: COMMERCIAL GRADE A/C & FORCED AIR HEAT, 220 electrical service, 2 PARKING STALLS (8,9). GST paid in full. Pets & rentals allowed with restrictions. A must see. See all Mount Pleasant lofts for sale at 1220 e pender st.
Artech Lofts offerse very unique warehouse conversion style lofts located right in Mount Pleasant, this building has all the features to make a home in a warehouse! See more details about Artech Lofts. Artech is managed by National Pacific, 604 685 8830. Click here to see all current property available at Artech Lofts at 336 E 1st St.
See our new building webpage for Sophia at 298 E 11th. A great new loft style condo building in Mount Pleasant, with great discounted prices. See the building details here. See all condos for sale at Sophia 298 E 11th. Sophia at 298 E 11th Ave is located right in the heart of Vancouver's central Mount Pleasant. This new development offers a fantastic location right near the up-coming "Olympic Village." Sophia offers uptown living with features and including 9 ceilings, hardwood floors, open concept kitchens with granite and wood finishes. Most units include storage lockers and parking. From small one bedroom, to townhouses, to large view suites, Sophia offers a fantastic new construction condo living with modern lofty styling.